The hydrapatch is an on-skin device that gives athletes, workers and clinicians a visual indication of the amount of moisture they • are losing through the skin. Users receive immediate feedback of the amount of liquid they need to consume to replace moisture lost due to their activity. Wherever it is important for the user to measure their measure loss. Regardless of the level of proficiency in the sport. User gets immediate indication of % water loss. With the added benefit of ensuring that the user consumes the liquid with which the invention is distributed. Uncomplicated, simple visual indicator of body moisture loss. Easy-to-use and does not require significant education of the end-user. Doesn’t contain electronics. But could in future as a product differentiator. Applied to skin in similar fashion to a nicotine patch. Easily distributed to user target market in conjunction with existing products e.g. a sports drink bottle or pack. Does not add significantly to the weight of the product. The rate and amount of water loss experienced by athletes and sports people could impact them physiologically through headaches, dizziness and in their performance in their particular sport. The threats of moisture loss may not be as significant for professional athletes, but rather amateur athletes and sports people who are not as educated about the threats are probably impacted more because of a lack of knowledge and experience in managing it. The high costs involved in moisture loss monitoring have been a limitation for the benefits of these techniques to reach a broader market e.g. 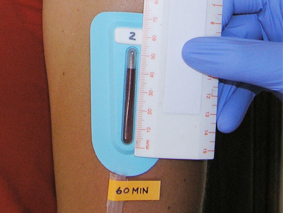 the Biotex intelligence sensing patch and other techniques used in research laboratories. The need for complicated machinery to read the user’s moisture loss either after or during an event, e.g. sweat patches and their associated machinery and the body glove. No need for electronic interfaces to read the user’s moisture level. ideally have a strong association with sport innovation, research and the application of that research for a global market. The licensee would have their sports hydration- type products and other related products with a global footprint. The licensee would need to have a well-established supply and distribution chain. The opportunity includes the licensee’s ability to brand and market the device, use it as a means to establish and grow their existing product’s market share and to give them a competitive advantage in the end-user’s mind. A PCT (PCT/IB2013/044450) application was filed on 29/05/2013 . The scope of protection for the IP is broadly protected and includes the device and possible alternatives of the device including potential salt measuring innovations. Our intentions are to protect the IP in various territories through the Patent Convention Treaty including but not limited to the United States of America, the European Union, China, South Africa and certain countries in South America. We value the opportunities that the IP protection strategies will give our licensing partner, and would be open to the partner’s suggested areas of protection.